Vishal Sikka has resigned as the Chief Executive Officer and Managing Director of Infosys. Pravin Rao has been appointed as the interim CEO. In a letter to stock exchanges, Company Secretary AGS Manikantha confirmed the development, saying the resignation was accepted at a board meeting on August 18. Sikka will now be the executive vice-chairman of the company. “The succession plan for appointment of a new Managing Director and Chief Executive Officer has been operationalised by the Board and a search for the same has been commenced,” the letter read. As the news of Infosys CEO and Managing Director Vishal Sikka’s resignation came in, the benchmark BSE Sensex plunged by 207.75 points or 0.65 per cent to 31,587.71 in early trade trade on Friday. 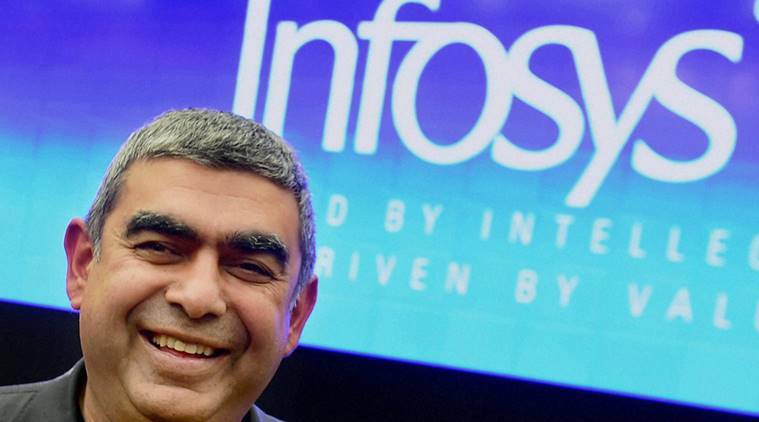 In a press release issued, Infosys said: Sikka has been appointed executive vice chairman effective today (August 18), and will hold office until the new permanent Chief Executive Officer and Managing Director takes charge, which should be no later than March 31, 2018. Sikka will continue to focus on strategic initiatives, key customer relationships and technology development. He will report to the Company’s Board. UB Pravin Rao has been appointed Interim Chief Executive Officer and Managing Director reporting to Sikka under the overall supervision and control of the Company’s Board. “Vishal has made a seminal contribution to the transformation of Infosys, and he will be remembered for infusing a refreshed sense of direction, purpose and energy in the organization. His vision for the future of the industry and the Company will remain a strong reference point as we chart the future course for Infosys in this new era in our rapidly evolving industry. On behalf of our entire board of directors, I wish him well for the future,” said R. Seshasayee, Chairman of the Board. In his resignation letter, Sikka said: “After much reflection, I have concluded that it is indeed time for me to leave my current positions as MD and CEO, and I have communicated my resignation to Sesh. I will be working closely with Sesh, Ravi, Pravin, with all of you, and the senior management team to plan out the details and the timelines to ensure a smooth transition and in the meantime, continue our work without disruption, and ensuring that we protect our company, the employees, the clients, and the interests of every shareholder. You can count on my commitment to this. U B Pravin Rao is currently the Chief Operating Officer responsible for the entire portfolio of the company’s offerings. According to a press release, Rao oversees the key functions of global sales, global delivery and business enabling functions. He drives and oversees the continuous renewal of key processes, systems and policies across the company in client relationship management, sales effectiveness, delivery excellence, quality, talent management and leadership development. Pravin is also Chairperson of Infosys BPO. He comes with 30 years of experience. Be the first to comment on "Vishal Sikka resigns as MD and CEO of Infosys"